For gifts and personal presents The Cover Nippon gift store has been always a must visit place for many of the business men and delegates from across the world. In the busy schedule of business visits we try to bring the Japanese culture through the Japanese products to you. The shop is located inside Tokyo Midtown in Roppongi, Tokyo. 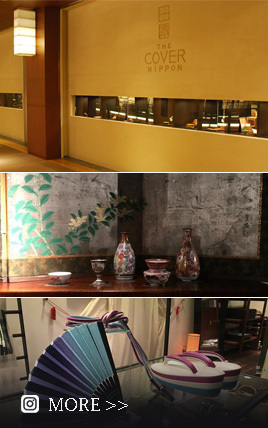 You can buy traditionally handcrafted products for decor by artisans from all region of Japan. Ranging from clothes, food and lifestyle necessities like Kimonos and Japanese sake, you will able to feel the artist passion through each and every product. Each product is different in origin and use. There is an unique yet beautiful harmony between the uses and origin.For the best lifestyle products and love of Craft, craftsmen and the Japanese culture, please visit our store.Our staffs are multilingual & speak English, Chinese, French etc. COPYRIGHT©　THE COVER NIPPON ALL RIGHTS RESERVED.